Seibertron.com Energon Pub Forums • new and old bots on display! new and old bots on display! 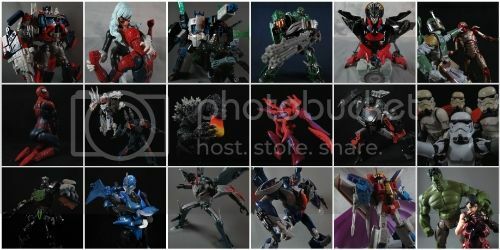 Here is most of them... mostly new ones but my favorites are the beast wars. by the way... cybertron skorponak and a few others are hiding behind a box... so you can't see them.the G1 style Soudwave is there to but you can't see much. I wonder what someone will think of Skyburst's hiding place! anyone know why cybertron lugnuts looks like a junkion? I also have a speical display for cyberverse and legends. I'll share that later. Re: new and old bots on display! ya got some nice stuff in there is that spiderman TF any good? Sure! Spiderman TF is a decent figure. I was really happy when Marvel TF crossovers came out. I most want the Iron man Humvee TF. but never have I actually bought it. I would advise against having any that close to a window. Ultraviolet rays will kill those toys faster than Galvatron vaporized Starscream. Check out my collection, Grand Maximus compels you!! Also, please be sure to give my podcast a listen. It's a pop-culture podcast covering everything from toys, to comics, to movies. If you're a nerd, you'll love it. No need to worry about the windows... My TF's are usaully kept someplace else. I Move my Collection around alot, I try to find good places for them. but I only have so much space. 5,280 pages were recently viewed by 997 unique visitors. This page was viewed 1 times on Sunday, April 21st 2019 9:07am CDT. © 2019 Seibertron, Inc. DBA Seibertron.com. All Rights Reserved. Established June 2000. Seibertron.com is owned by Ryan Yzquierdo.